Finally I could plug in my testbed a member of the Radeon RX 400 family. 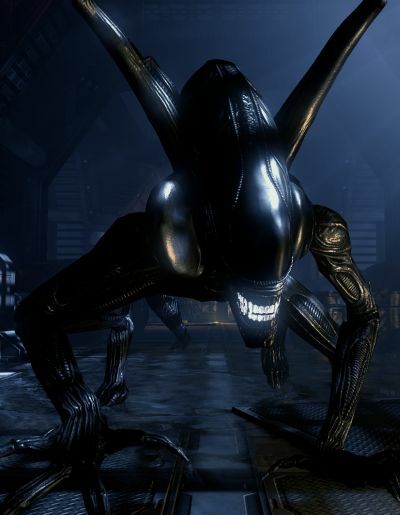 It was time, because the GPU monitoring code used in current versions of FurMark, GPU Caps Viewer or GPU Shark doesn’t support AMD’s RX 400 GPUs. Now it’s fixed, thank you MSI! 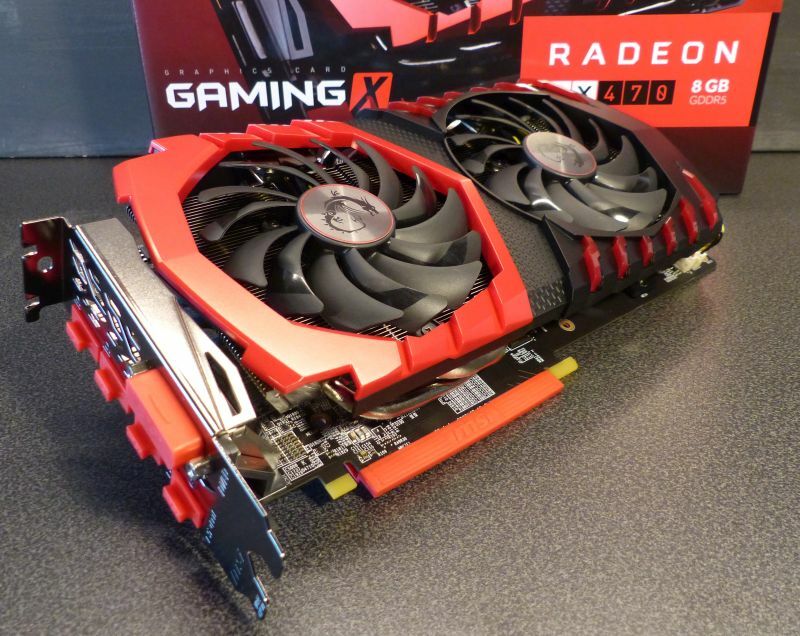 The Radeon RX 470 has been launched about three weeks ago and is based on AMD’s Polaris GPU architecture (14nm FinFET process). The RX 470 is based on the Polaris 10 GPU which is also codenamed Ellesmere (the name of an island in the Northern Canada). The Polaris 10 GPU that boosts the RX 470 packs 2048 shader cores (32 compute units), 32 ROPs, 128 TMUs and works at 1206MHz (boost clock). The RX 470 is available in two flavors: the first one with 4GB of VRAM and the second one with 8GB of VRAM. 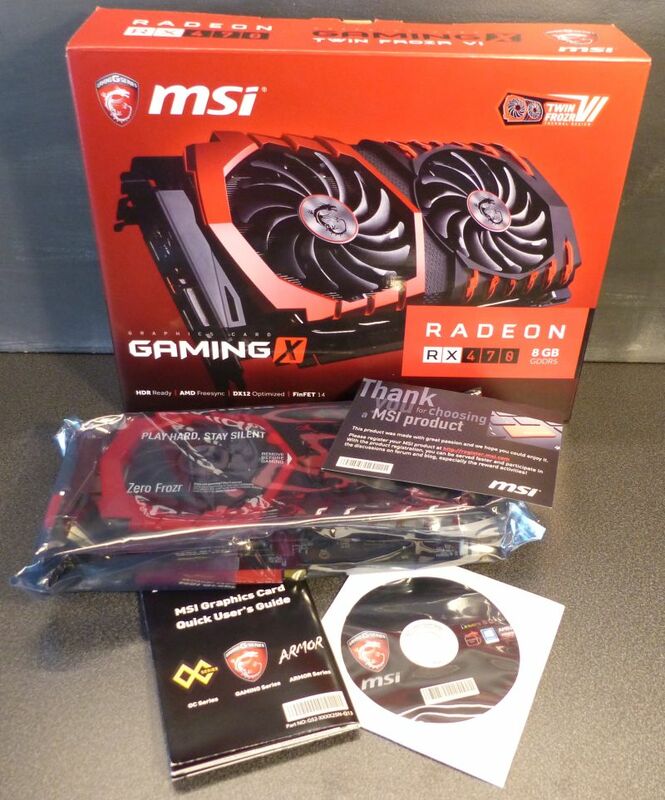 MSI sent me the 8GB GDDR5 version. The memory is clocked at 1650MHz. 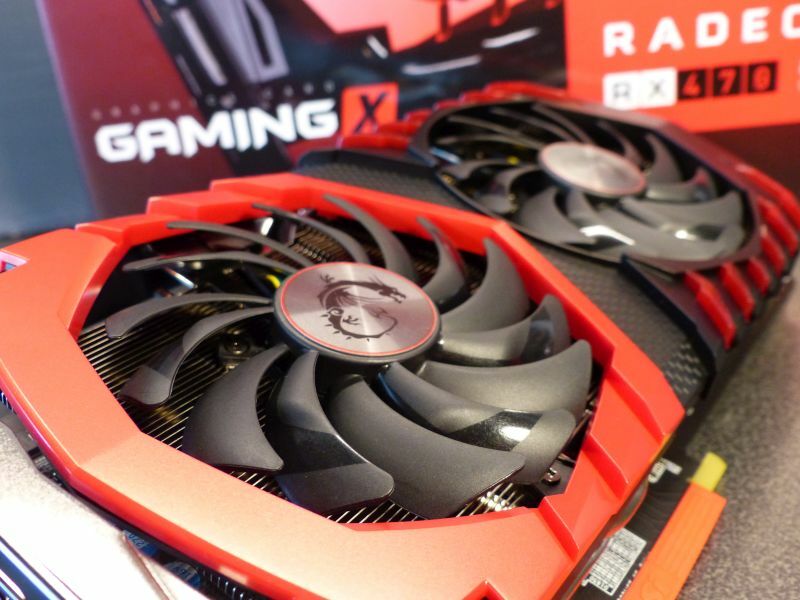 MSI RX 470 Gaming X is a factory-overclocked graphics card: the GPU runs at 1242MHz (gaming mode) or 1254MHz (OC mode). There is also an silent mode: 1206MHz with is the reference board clock speed. 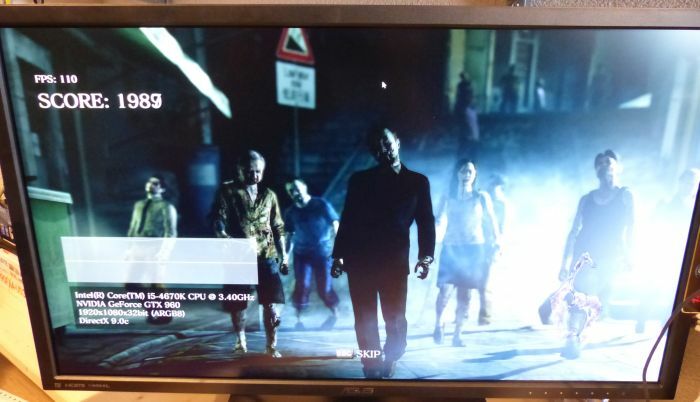 The graphics memory is not overclocked: the 8GB GDDR5 run at 1650MHz. Let’s start with the box and the bundle, if we can call it a bundle: the graphics card, a CDROM with driver and utilities and a user’s guide. I like the black/red VGA cooler. 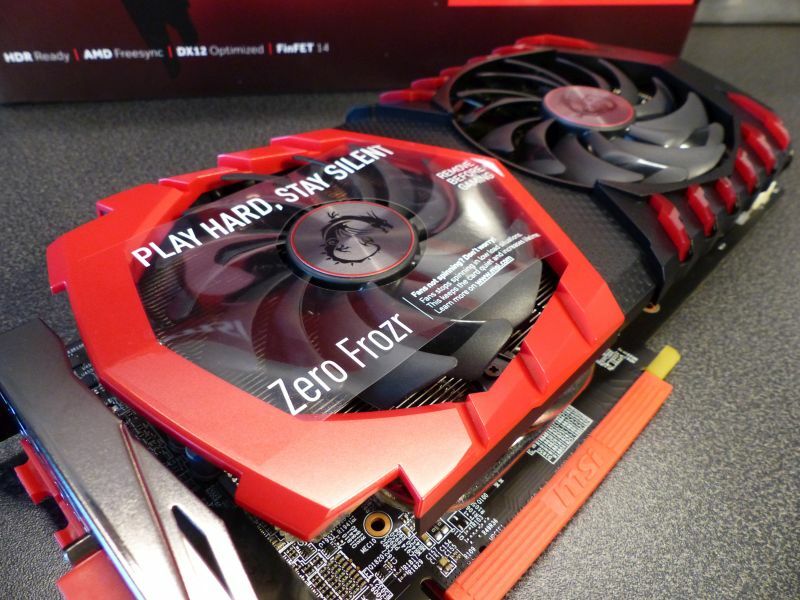 It’s based on MSI’s Twin FROZR VI cooling system. 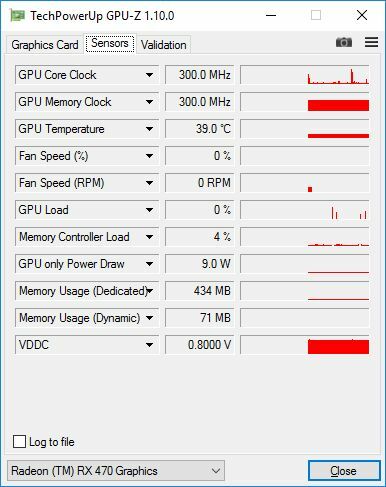 At idle (or when GPU temperature is less than 60°C), the fans do not spin (Zero Frozr technology): the graphics card is in passive/silent mode and is noiseless. Great! 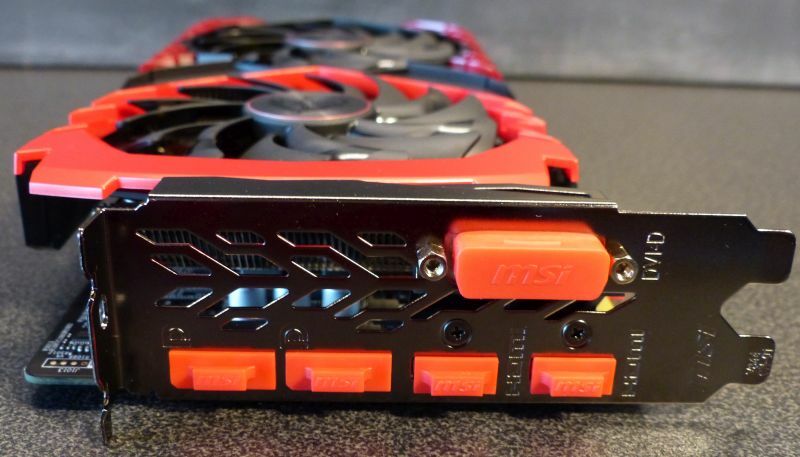 The RX 470 comes with one 8-pin power connector. A 8-pin power connector can supply up to 150W. The PCIe slot can supply up to 75W. That leads to a total power of 225W. 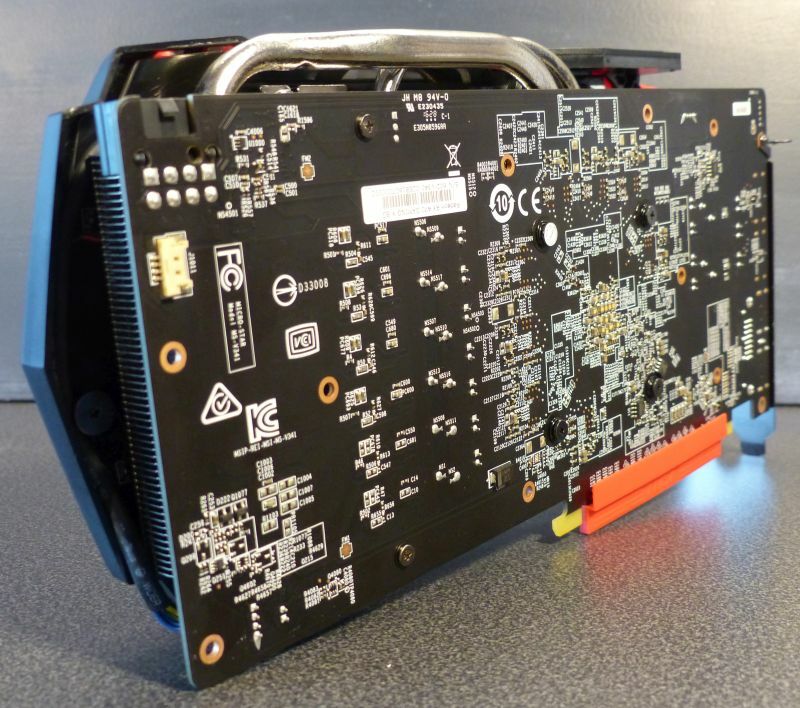 The RX 470 reference board has a TDP of 120W. Hum… We’ll focus on this power in the burn-in section. 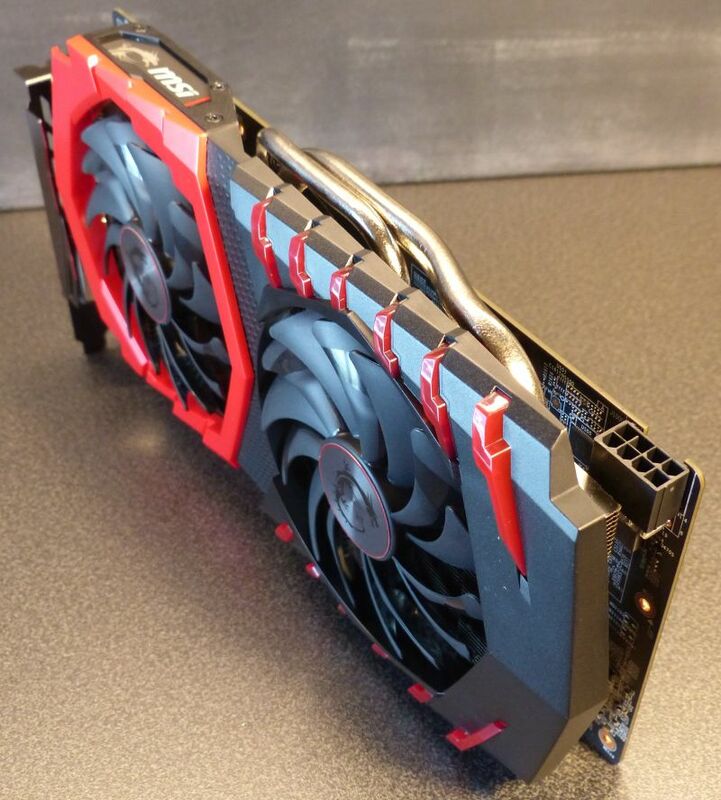 No backplate for the RX 470 Gaming X. Why? This card seems a bit fragile when you handle it, and really needs a backplate to make it more robust. 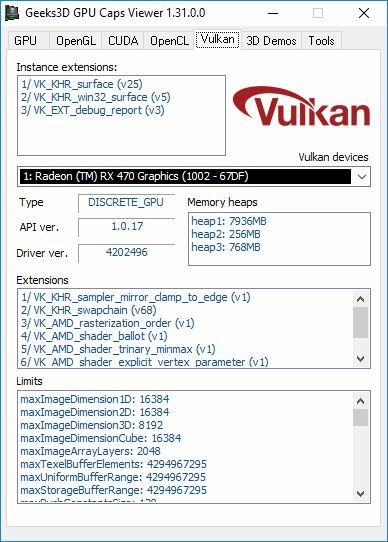 Tools: GPU Caps Viewer 1.31.0.0, GPU Shark 0.9.10, GPU-Z 1.10. This quick burn-in test has been done with Geeks3D FurMark 1.18. 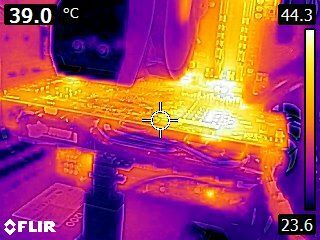 At idle, the total power consumption of the system was 46W and the GPU temperature was 39°C. And the noise? 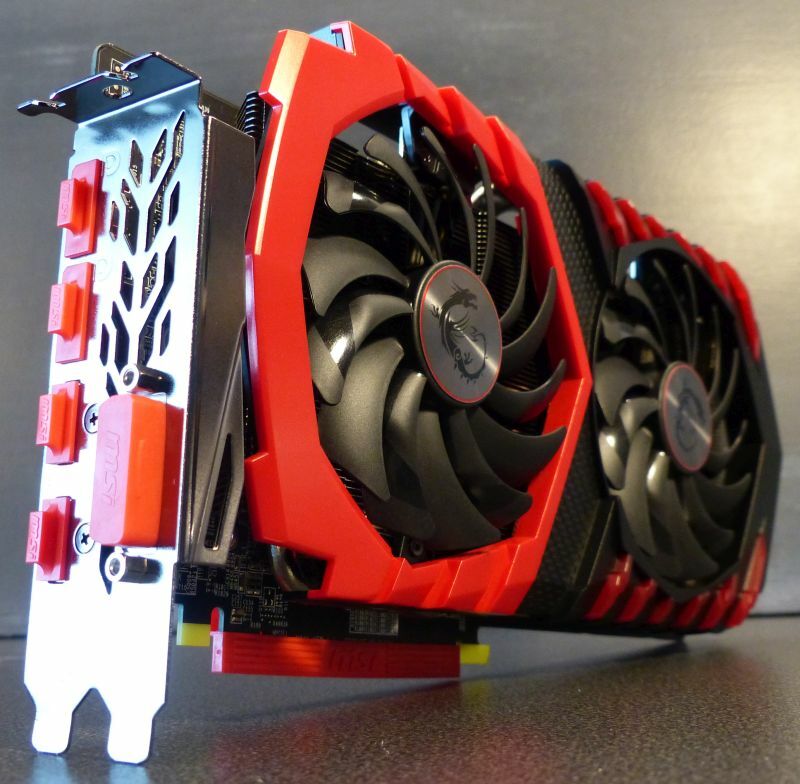 At idle, the MSI RX 470 is extremely quiet, or better, the card is noiseless (fans are stopped most of time thanks to the Zero FROZR technology). 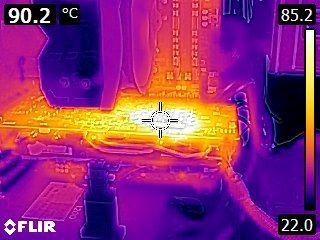 I launched FurMark in stress test mode in 1280×720 and after 5 minutes, the GPU temperature reached 74°C while the total power consumption jumped to 286W. 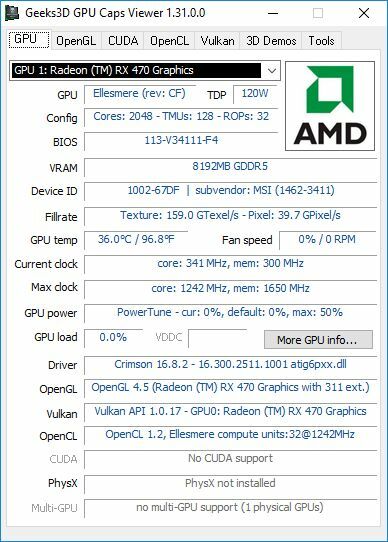 The RX 470 reference board has a TDP of 120W (100% TDP). With a TDP of 120W, one 6-pin power connector is enough. But MSI has selected a 8-pin power connector. A 8-pin connector can handle up to 150W and the total power draw of the board can reach 150+75 = 225W. So I think that these 198W are not too far from the real power consumption… My result is also confirmed by W1zzard’s RX 480 review at TechPowerUp. At 74°C, the fan noise was barely audible. MSI has one of the best VGA cooler! With 3DMark, the RX 470 competes with the GTX 1060. 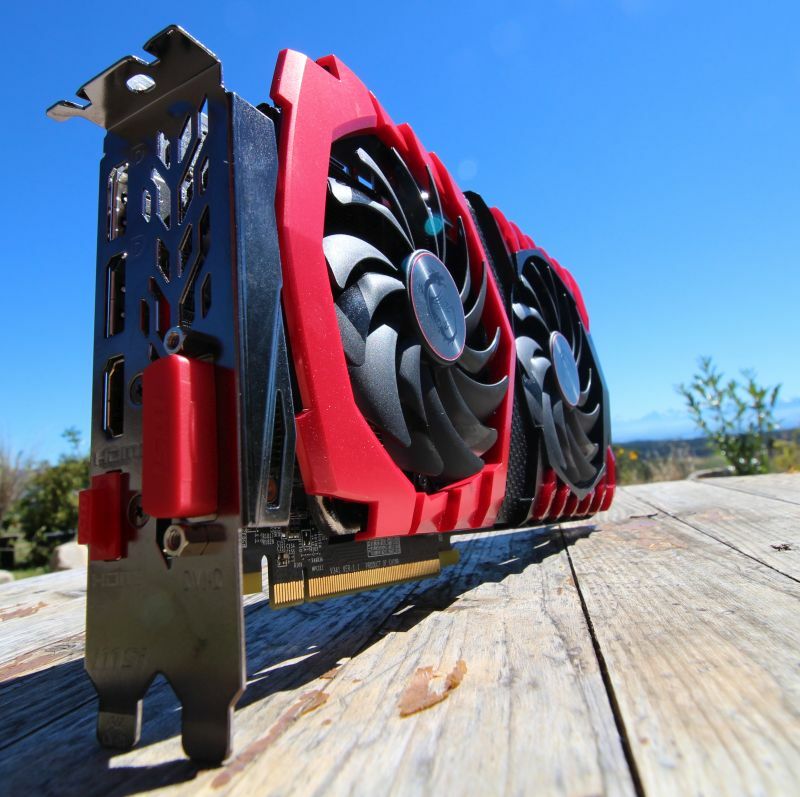 On other tests, the RX 470 is between the GTX 960 and the GTX 970. The VGA cooler is nice with its black and red colors, and does an admirable job: the card is extremely quiet while keeping low temperature. 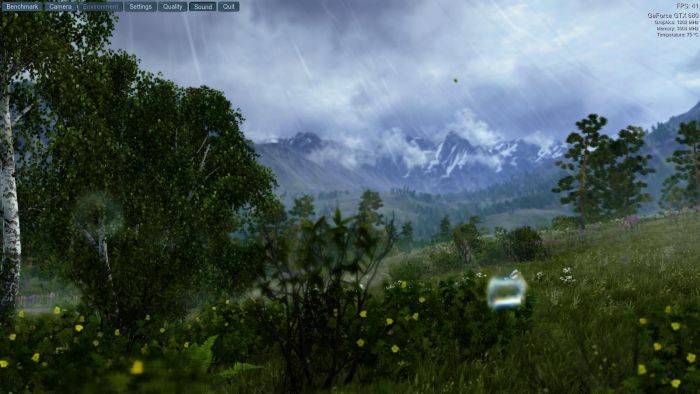 In idle or light 3D situations, fans are stopped and the card is simply noiseless. Under stress test, fans spin but the noise is barely audible. MSI Twin Frozr VI VGA cooler is just fantastic! 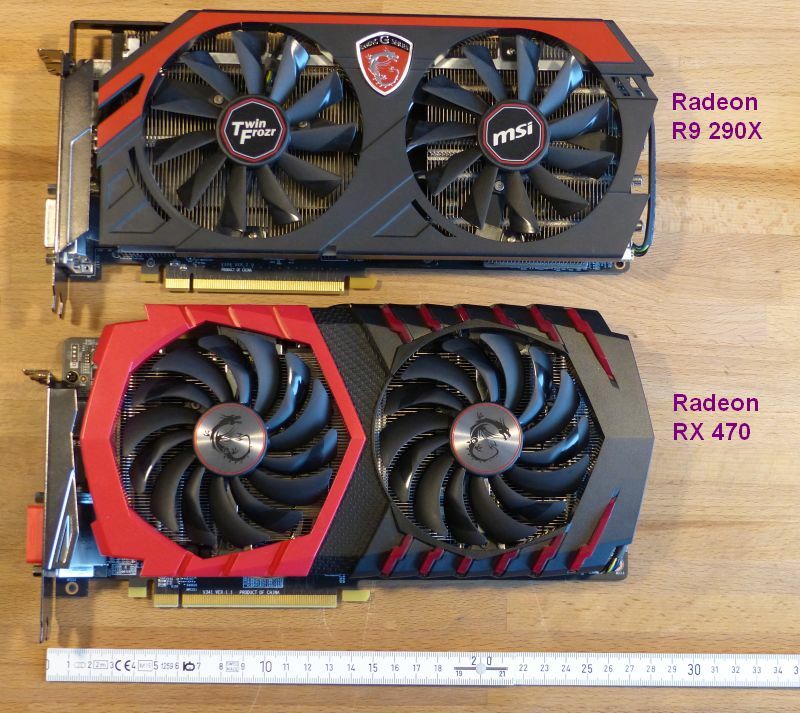 The power consumption of the RX 470 (around 200W) is a bit high especially if we compare it to the TDP of the RX 470 reference board (120W). 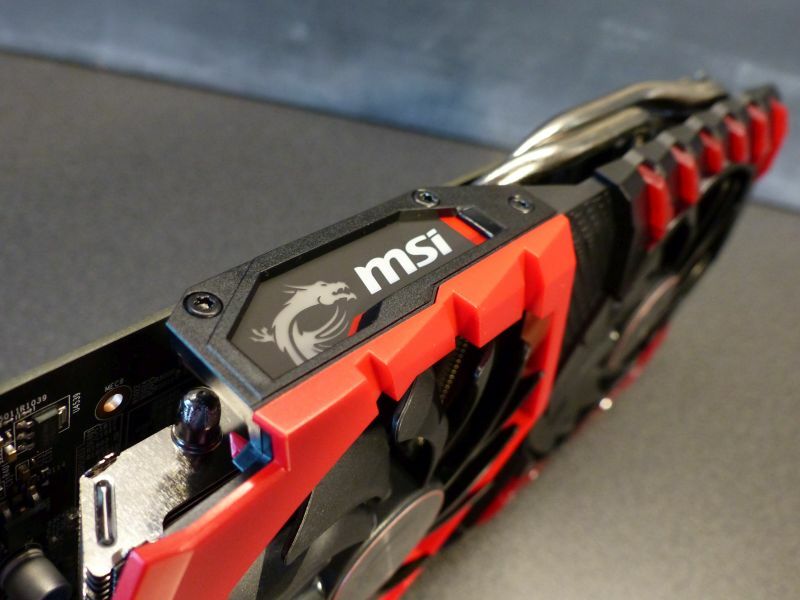 But MSI has managed this power greedy GPU with a 8-pin power connector, so everything is under control. I don’t know if it’s related to the power consumption or not, but the testbed has suffered from several freezes (no more image on the display but still a video signal). Each time, a hard reboot was the only solution. 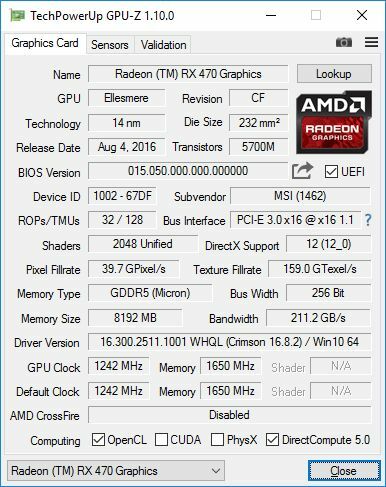 I never had such freezes with the other graphics cards, only with the RX 470. I hope it’s only related to this particular sample. 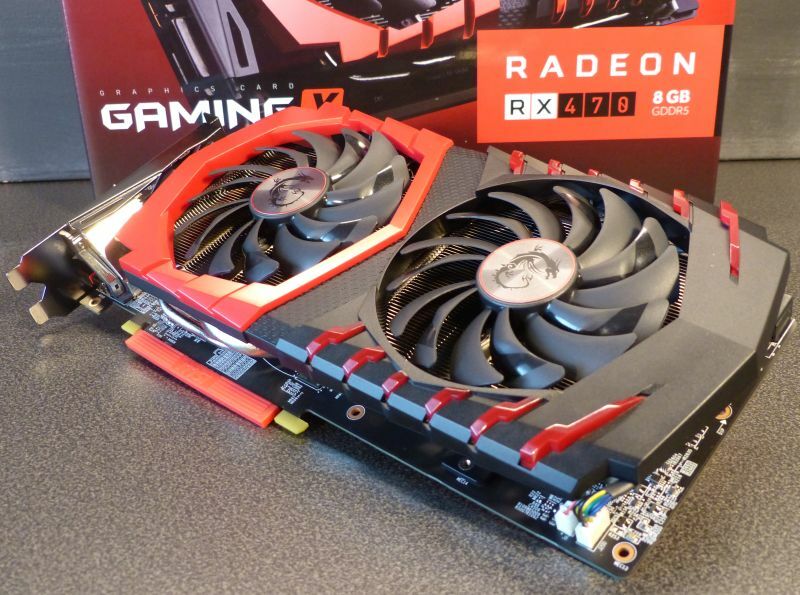 If we forget this minor issue, this RX 470 has nice features: great looking card with its black/red VGA cooler, two DisplayPort 1.4 and two HDMI 2.0 ports (for 4K resolution on UHD TVs), 8GB of GDDR5 memory, Zero Frozr technology for very quiet working (one of the fundamental features for me), customizable lighting. The lack of backplate and the power issue I talked previously are the weakest points. 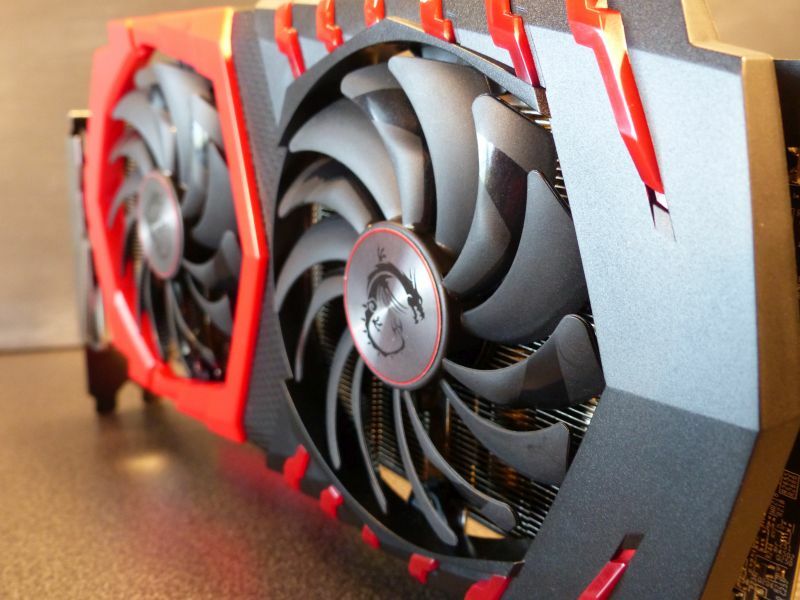 Otherwise, the MSI RX 470 Gaming X 8GB is a great product.